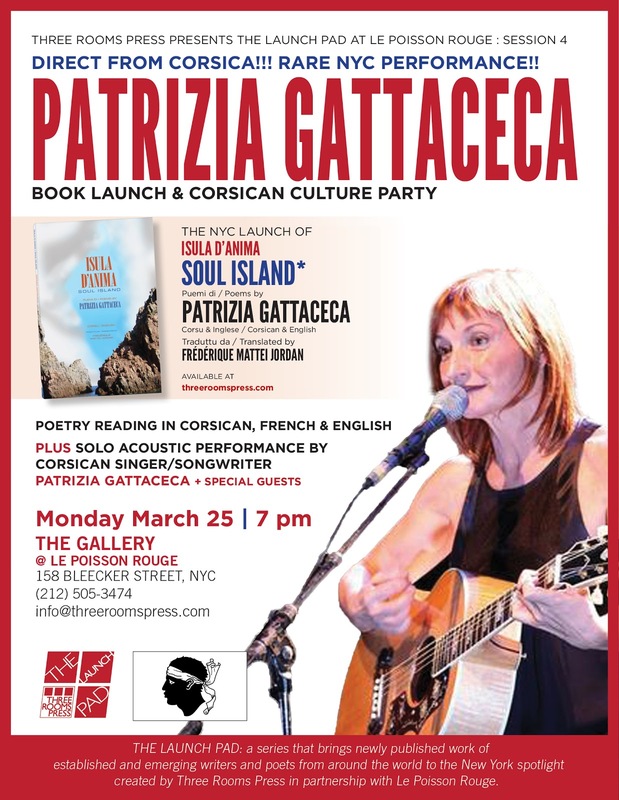 Renowned Corsican singer/songwriter/poet Patrizia Gattaceca travels to New York City for the launch of her first English / Corsican book Isula d’Anima / Soul Island (Three Rooms Press) at Le Poisson Rouge on Monday, March 25 at 7 pm. 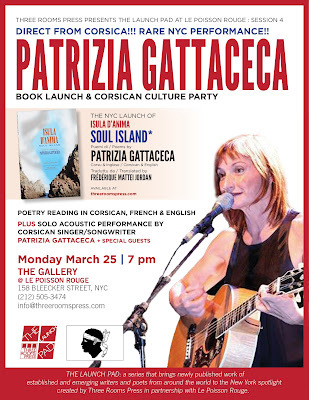 She will read from her book in English, French and Corsican, plus perform her music, with special guests. In addition to her creative work, Gattaceca is known as “one of the most courageous women of France.” In 2007, she was accused of aiding Yvan Colonna, a suspect in the 1998 murder of Claude Érignac, the prefect of Corsica. Some background: On February 6, 1998, as he left a theater in Ajaccio, Corsica, Érignac was shot three times in the neck. An investigation identified Colonna as the prime suspect. He disappeared, sparking the biggest manhunt in French history. Colonna was captured in 2003. Four years later, Gattaceca was indicted for aiding Colonna in 2002 and 2003. She was shackled, brought to a Paris prison and fiercely interrogated for nearly a week. For three years, while her case was pending, she was unable to leave France, hampering her international singing career. When she finally was brought to trial in May 2010, she risked years of penal servitude for aiding Colonna. She admitted to feeding Colonna but denied that act made her a terrorist, telling Journal du Diamanche in a pretrial interview that while she disobeyed one law, she had obeyed another: “the duty to show hospitality and solidarity toward someone she considered innocent.” In July 2010, she was sentenced to time served. The prosecution immediately made an unprecedented appeal and, after numerous delays, Gattaceca is slated to go back to trial in April 2013. The Three Rooms Press edition of Isula d’Anima / Soul Island marks one of the world’s only Corsican-English poetry books. UNESCO classifies Corsican as a potentially endangered language, although it is a key vehicle for the preservation of Corsican culture which is rich in proverbs and polyphonic song. Three Rooms Press’ goal in publishing the book was to help preserve the language, and thereby the culture for future generations. The Launch Pad @ LPR is a series, created by Three Rooms Press in partnership with Le Poisson Rouge, which brings newly published work of established, emerging and estranged poets from around the world to the New York spotlight. Session 4 of The Launch Pad @ LPR is Monday, March 25. Doors open 6:30 pm; showtime: 7 p.m. Le Poisson Rouge is at 158 Bleecker Street (at Thompson).